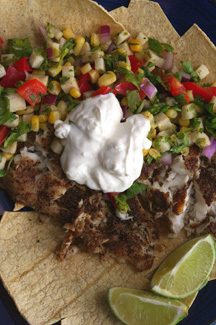 Tilapia has become my most-used fish; I tend to interchange it with catfish often. Tacos are a great, fun, family food, and corn tortillas are fantastic. I customized this recipe, from All Recipes, for four servings, using 16 oz. of fish. My version made a lot of salsa -- more than I needed for four servings. The crunchy salsa did need some salt added to it. The spice rub for the fish asked for more than 1 Tbsp. of cayenne pepper, but there was no way I would use that much. I used only 1/2 tsp. and even that was too spicy. The spices and the grilling made for nicely colored tilapia. I served my tacos with a side of guacamole (and that’s always guaranteed fun). TASTE: beware of too much cayenne! Let’s get a little more extravagant with the next meal. I’ll make “Tomato Chicken Parmesan,” from All Recipes, with a side of “Orzo Casserole,” from the May 2003 issue of Vegetarian Times. Return to my site on Wednesday, August 22, to see how good they are.